Lene Kaaberbol is a Danish author. Besides the epics listed here, she writes the NINA BORG MYSTERIES and the W.I.T.C.H. graphic novels. Read excerpts of her books at Lene Kaaberbol’s website (English version available). CLICK HERE FOR MORE BOOKS BY LENE KAABERBOL. The Shamer Quartet — (2000-2003) Young adult. Publisher: Dina has unwillingly inherited her mother’s gift: the ability to elicit shamed confessions simply by looking into someone’s eyes. To Dina, however, these powers are not a gift but a curse. Surrounded by fear and hostility, she longs for simple friendship. 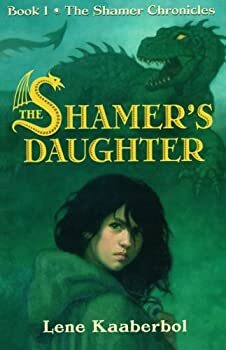 But when her mother is called to Dunark Castle to uncover the truth about a bloody triple murder, Dina must come to terms with her power — or let her mother fall prey to the vicious and revolting dragons of Dunark. The Shamer's Daughter is in itself a pleasant little story that moves along well and has at its core an extremely intriguing concept that here is unfortunately not fully explored, but the good news is that while The Shamer's Daughter is an ok read, its sequel, The Shamer's Signet, is a much stronger book, well-rewarding the reader who begins the series. Katriona — (2006-2009) Ages 9-12. Previously published in Denmark. Publisher: Danger, excitement and deadly hellhorses… an epic adventure begins. In the country of Breda men are forbidden a home to call their own. They live as nomads, resting only at the mercy of the ruling women. Kats mother, Tess, the Maestra of Crowfoot Inn, is one of these powerful women and Kat has always known it is her destiny to follow in Tesss footsteps. But then one rain-swept night a scarred woman comes to Crowfoot riding an extraordinary silver horse and Kats world is turned upside down. From that moment on it is her burning ambition to become a Bredanaria keeper of the peace and rider of these magnificent creatures. But it isnt easy for a girl from the Vales to fit in at the Bredanari training academy in the big city. Worse still, Kat knows something which has put her life in danger. She has accidentally discovered the whereabouts of a dangerous outlaw known as Ermine. Now there are ruthless people who will do anything to keep her from revealing this secret, including leaving her unconscious on Hellhorse Mountain, where the beautiful but deadly stallions run wild. Kat soon finds herself deeply enmeshed in the dangerous plots and politics that threaten her country, not to mention the life of someone she has come to love. This is the first of two spellbinding books following Kat’s adventures.